Team building has been designed to bring each member of a group together; emphasizing communication, listening, and cooperative skills. Trained staff will lead participants through a series of challenges requiring ingenuity, innovation, and patience. Leadership combines communication, empowerment, and decision making. Participants examine leadership styles of others while developing their own techniques. We enable people to better understand motivation, cooperation, and language. These courses can be implemented as a one day program introducing students to the benefits of teamwork. The are best facilitated as multi-day programs, allowing participants to explore many different aspects of team oriented performance. Here are a few examples of activities designed to meet the needs of any age group. Giant Spider Web: in which the whole group must get through without waking the spider. 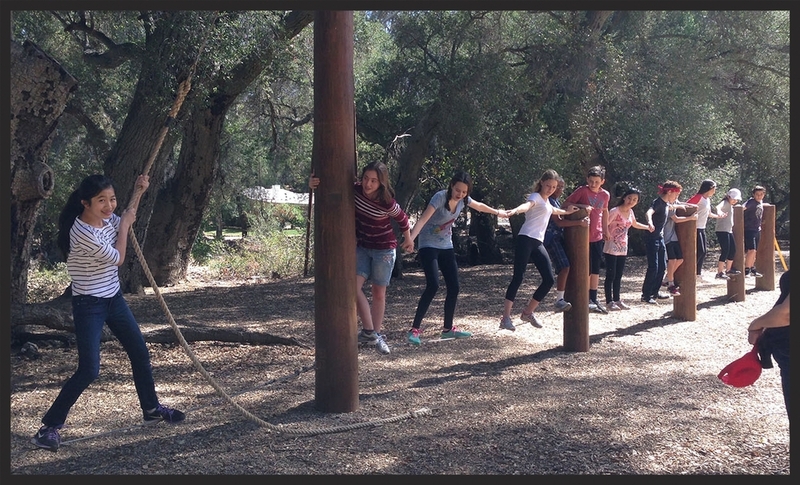 Team Teeter-totter: Balancing the entire group on a giant teeter-totter without ever letting it touch the ground. Nitro Swing: Successfully transporting your team and a vile of liquid from one platform to the next via rope, all the while not spilling a single drop of liquid. Blind Trust Walk: With a partner one person is blindfolded, discover your limits starting out walking around holding hands, leading into a jog, then into a full on sprint. Jewels: Working together to recover "jewels (goals)" set out by fellow teammates. Limited by a small rope circle, the team must work together to help individuals reach out for their goal. Acid River: Using small square tiles, the whole group must transfer a distance all together. If they fall off a tile, the whole team starts over again. The catch is not having enough tiles for the entire team to stand on. Sharing and communication are stressed during this activity. Blind Polygon: Participants are blindfolded. A circle of rope is placed on the ground in front of them. They are to pick up the rope with both hands without letting go making a square. They can slide their hands along the rope and talk with each other. When they believe they have a square, participants remove the blindfold to reveal what they have done. The cornerstone of every WOLF program is the array of games and challenges designed to progressively build on success, culminating with several powerful activities that pull from both group and personal strengths. The high ropes course and the climbing wall help individuals overcome his/her own fears with the support of their group. In a safe environment, participants are asked to face challenges they thought unfeasible. In overcoming these fears, they develop self-reliance and confidence, learning to draw courage from their inner strengths.